The Eastern Shore Land Conservancy invites the public to join us at The Packing House (formerly known as Phillips Packing Co.’s ‘Factory F’ ) on July 31st at 11:30am as Maryland Comptroller Peter Franchot presents ESLC with the Bright Lights Award for Innovation and Entrepreneurship! 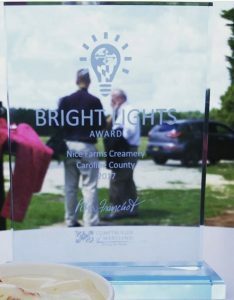 The “Bright Lights Award” pays tribute to businesses and nonprofit leaders and organizations that foster innovation in their fields. More specifically, the award recognizes and celebrates innovation in the private and nonprofit sectors that strengthen Maryland’s economy, generate jobs and tax revenue, and develop new ideas that more effectively deliver services and products within the marketplace. The Packing House is located at 411 Dorchester Ave., Cambridge. The event will last approximately one hour, with Comptroller Franchot presenting the award at approximately 12pm. A tour featuring discussion about the history and future plans for the building will be available to guests. Walking shoes are encouraged! Note: ESLC is currently crowdfunding for the stabilization of The Packing House smokestacks – an essential part of Phase 1 of the revitalization process. Please contribute and/or help spread the word!